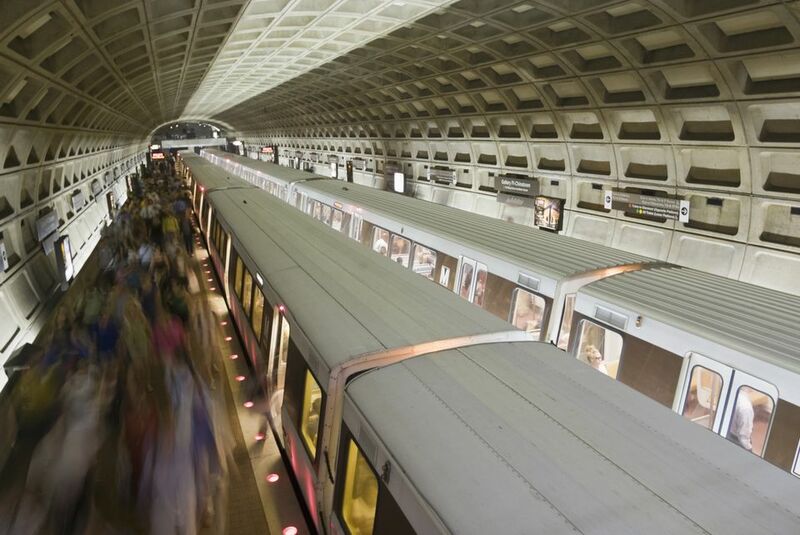 The Washington Metro, the District's regional subway system, provides a clean, safe, and reliable way to get around almost all of the major attractions in Washington, D.C., and extends to the suburbs of Maryland and Virginia. Although the Metrorail trains can be crowded with commuters during rush hour and when there is a big event going on downtown, taking the Washington Metro is usually cheaper and easier than finding a place to park in the city. Several Metro stations are helpful sightseeing stops. Since opening in 1976, the Metrorail network has grown to include six lines, 91 stations, and 117 miles of track. It is the third-busiest rapid transit system in the United States in the number of passenger trips after New York City and Chicago. It is administered by the Washington Metropolitan Area Transit Authority (WMATA). The Metro lines intersect so that passengers can change trains and travel anywhere on the system. A seventh line is proposed, the Purple Line, with service to Maryland, which is expected for completion by 2022. Yellow: Huntington to Mt Vernon Sq 7th Stree-Convention Center. The Metro begins operation at 5 a.m. on weekdays, 7 a.m. on Saturdays, and 8 a.m. on Sundays. Service ends at 11:30 p.m. Monday through Thursday, 1 a.m. Friday and Saturday, and 11 p.m. on Sundays, although the last trains leave their terminals about a half an hour before these times. Trains run frequently averaging four to 10 minutes between trains with frequency increasing during rush hour times. Night and weekend service varies between eight and 20 minutes, with trains generally scheduled only every 20 minutes. A SmartTrip Metro farecard is required to ride Metro. The rechargeable, proximity card is encoded with any amount up to $300. If you register your card, and you lose it or it is stolen, you do not lose the value of the card. Fares range from $2 to $6 depending on your destination and the time of day. Fares are cheaper after 9:30 a.m. until 3 p.m. and after 7 p.m. until close. An all-day Metro pass is available for $14.75. Metro charges reduced fares on all federal holidays. Discounted fares are available for school children, the disabled, and the elderly. Up to two children, age 4 and under, ride free with each adult paying full fare. Children 5 and older pay adult fares. The fare is automatically deducted from your card when you exit the gates. You can keep reusing the same card and add money to it at the SmarTrip vending machine. You may add value to a SmarTrip card from the convenience of a computer. To use the online reload feature, you must have a registered SmarTrip card and online account. To complete the transaction, you must touch your SmarTrip card to a Metrorail fare gate, vending machine, or bus fare box. The same card can be used to pay for Metrobus fare. Employers may provide free transportation as a fringe benefit to their employees. Employers can assign transit benefits directly to their employees' SmarTrip card. Metro operates parking facilities at 44 Metrorail stations. You can use your Smartrip card to pay for parking at the Metro Stations. Major credit cards are accepted at most parking facilities. The cost of parking at a Metro parking lot ranges from $4.70 to $5.20 during the week and is free on weekends and holidays (except during special events). Reserved monthly parking permits are available for $45 to $65 at all stations and this fee is paid in addition to the regular daily parking rate. No eating or drinking is allowed on Metro. As a courtesy, handicapped seating must be available for the disabled or elderly. To assist with the flow of passengers, allow people to get off the train before you board. The most crowded times are 7:45 to 8:45 a.m. and 4:45 to 5:45 p.m. The busiest days are Tuesdays, Wednesdays, and Thursdays. If you have flexibility in your schedule, consider riding Metro during the reduced fare hours: After 9:30 a.m., before 3 p.m. and after 7 p.m. on weekdays. Save time by keeping enough fare on your card so that you do not have to add money at the vending machine each time you ride. Keep your money and valuables out of sight. Safety call boxes (dial "0") are located at the end of each rail car and every 800 feet along the tracks if you need to report an emergency. Always be aware of your surroundings. For your security, Metro Transit police officers are at the stations and on trains and buses.